If it were up to me, I could pretty much eat sandwiches all of the time and probably every day. They’re great for breakfast, lunch or dinner and very often we will have different variations of sandwiches for dinner during the week to make things a little bit easier to fit into our crazy schedules. Chicken sandwiches are always a personal favorite and there are a lot of different things you can do with them. 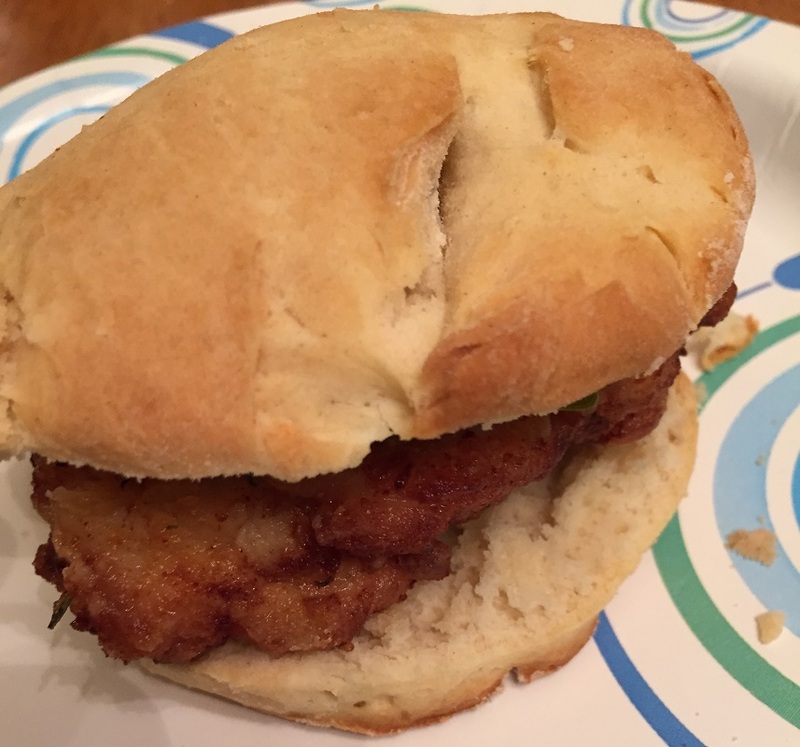 Sean really liked the fried chicken sandwiches I have made in the past and I have done them on biscuits before, but when I came across this particular recipe at Chow.com, it seemed like a really easy one to do and it made use of the boneless chicken thighs that I already had on hand. The recipe makes both the biscuits and the chicken and both are really simple to do so that you can have in easy meal just about any night of the week. For the biscuits, preheat the oven to 425° and arrange a rack in the middle of the oven. Line a large rimmed baking sheet with parchment paper. In a food processor, add the flour, baking powder, baking soda, and salt. Pulse to combine the mixture. Scatter the butter pieces over the top of the flour mixture and pulse until the butter is pea-sized. Add the buttermilk and pulse the mixture just until a moist, shaggy dough comes together. Alternatively, in a mixing bowl, the whisk together the flour, baking powder, baking soda, and salt. Scatter the butter pieces over the top of the flour mixture and toss to coat them in the flour mixture. Using a pastry blender, and working quickly, cut the butter into the dry ingredients until it is pea-sized. Drizzle in the buttermilk and stir the mixture just until he moist, shaggy dough comes together. Dust a work surface with flour. Scrape the dough onto the surface and dust the top with more flour. With floured hands, pat the dough into a circle 1-inch thick. Using a 3 1/2-inch round (or fluted) cutter dipped in flour, cut out as many biscuits as possible. Press straight down through the dough — do not twist the cutter, or the biscuits will not rise properly. Transfer the biscuits to the prepared baking sheet, spacing them at least 1-inch apart. Gather the scraps into a ball, pat it into a 1-inch-thick circle, and cut out more biscuits. Repeat as needed until you have 6 biscuits in total. Bake until the biscuits are golden brown, about 15 minutes. Set the biscuits aside to cool on a wire rack. For the fried chicken, arrange the chicken in a shallow baking dish and sprinkle it all over with salt; set the chicken aside at room temperature. In a shallow bowl, stir together the flour, paprika, cayenne pepper (if using), and thyme. Pour the buttermilk over the chicken and toss the chicken to coat it well. Add the vegetable or canola oil to a large, straight-sided cast-iron skillet or frying pan. The oil should be 1 1/2 to 2 inches deep, reaching slightly less than halfway up the sides of the pan. Warm the oil over medium heat until it reaches 340° on a candy thermometer. When the oil is ready, lift a piece of chicken from the buttermilk, letting the excess drip off, then dip the chicken into the flour mixture, coating it completely. Shake off any of the excess flour. Fry the chicken until it is cooked through and golden brown, turning the pieces halfway through the cooking process, about 6 to 8 minutes in total. The interior of the chicken should register 155° on an instant-read thermometer when you remove the chicken from the oil; the temperature will rise to 165° as the chicken rests. Drain the chicken on a paper towel-lined plate. To serve, split the biscuits and place a piece of the fried chicken on the bottom half of each biscuit. Add dill pickles, hot sauce, and the optional honey, or any other condiments you may like, cover the chicken with the biscuit top, and serve. There is nothing quite like having a piece of fried chicken, and having it on a flaky, moist buttermilk biscuit just seems to make it even better. I always add pickles to my chicken biscuits and they go really well with coleslaw either on the side or right on the biscuit itself with the chicken. Adding a little hot sauce to the mix also can kick it up just a bit if you like that kind of flavor, though the honey is also a nice touch and Sean did add some honey to the top of his piece of chicken and he said it went really well with the biscuit. You can serve these pretty simply with coleslaw or potato salad or any other type of salad you might like, or even some homemade or store-bought French fries if you prefer. Overall I think it is a great sandwich you could even do for a buffet or a party if you are all getting together to watch the game or hang out. That’s all I have for today. Check back next time for another recipe. Until then, enjoy the rest of your day, try to stay warm (it is about 4° here in New York without the wind, and with the wind it is about 15 below), and enjoy your meal!